(Nanowerk News) A total of $3.5 million in prizes will now be awarded to the top three finishers in the DARPA Robotics Challenge (DRC), the final event of which will be held June 5-6, 2015, at Fairplex in Pomona, Calif. The new prize structure was created in recognition of both the significant progress already demonstrated by teams toward development of human-supervised robot technology for disaster response and the increased number of teams planning to compete in the Finals, including those funded by the European Union and the governments of Japan and South Korea. Aside from the previously announced $2 million grand prize, DARPA plans to award $1 million to the runner-up and $500,000 to the third-place team. DARPA expects at least twenty teams to compete in the DRC Finals. Robots will have to operate completely without wires—they may not be connected to power cords, fall arrestors, or wired communications tethers. Teams will have to communicate with their robots over a secure wireless network. Teams are not allowed any physical intervention with their robot after it begins a run. If a robot falls or gets stuck, it will have to recover and continue with the tasks without any hands-on assistance. If a robot cannot sustain and recover from a fall, its run will end. DARPA will intentionally degrade communications between the robots and human operators working at a distance. 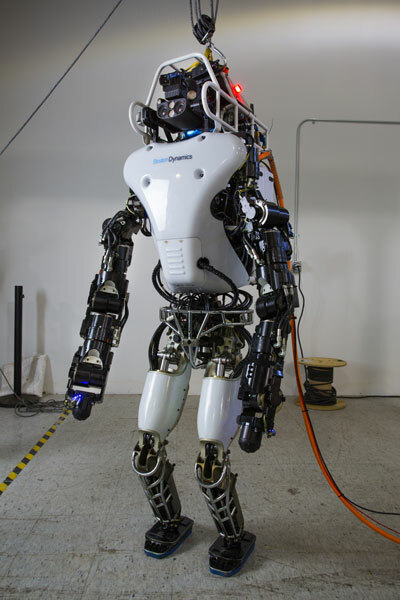 The idea is to replicate the conditions these robots would face going into a disaster zone. Spotty communication will force the robots to make some progress on their own during communications blackouts. The seven DRC teams using Atlas are scheduled to receive their upgraded robots by the end of January. The robots will be delivered with a “battery emulator,” a training tool temporarily mounted in the robot that simulates how the real battery will perform. This will allow them to switch modes between constant voltage for routine practice and metered voltage to simulate actual battery life. Teams are likely to keep their robots connected to fall arrestors during much of the remaining months of training as a safeguard against premature damage to the robot. DARPA demonstrated the new Atlas with a fall arrestor in place.